Atlantic breezes cool our vineyards creating a climate hospitable to a wide array of fascinating grape varieties. At Channing Daughters we grow and create wines from the white varieties Chardonnay, Pinot Grigio, Tocai Friulano, Sauvignon Blanc, Muscat Ottonel, Malvasia, Gewurztraminer, and Pinot Bianco, and the red varieties Merlot, Blaufrankisch, Pinot Noir, Dornfelder, Cabernet Franc, and Cabernet Sauvignon. Soon the reds Teroldego, Refosco and Lagrein will join them. We are the only winery on the East End growing and producing wines from many of these grapes. 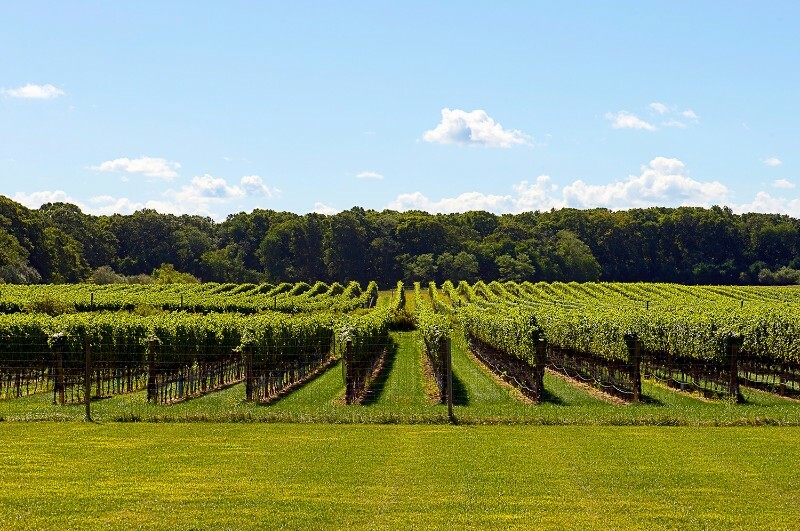 Our home is a beautiful plot of land in Bridgehampton that contains twenty-five acres of vines, our small winery and tasting room. We source about fifty percent of our grapes from special sites and people on the North Fork. Our foremost commitment at Channing Daughters Winery is the care of our grapevines and the quality of wine in the bottle. Starting with intense and careful culture of our vines to the hand-picking of ALL grapes, gentle whole cluster-pressing of white fruit, stomping by foot with punch-down by hand of red grapes, and gravity bottling, our methods remain traditional and artisanal. Wine is grown by hand at Channing Daughters. We are proud of every single bottle and are excited about your interest in our wines. We are interested in continually pushing the boundaries of what is possible in our vineyards, our cellar and our region. Currently we are producing about seven thousand cases of wine a year spread across twenty-six different bottlings. We strongly believe there are different foods, occasions, people, seasons and moods that demand different flavors, smells, textures and styles of wine. To this end we create single vineyard varietal wines and blended wines, wines made with indigenous, wild yeast as well as commercial yeast, and occasionally a blend of both. Some wines are filtered and fined, some are not. Stainless steel tanks and barrels as well as French, Slovenian, American and Hungarian oak barrels are used in various sizes, formats, percentages and ages. We will co-ferment white and red fruit. We enjoy fermenting some white wines on their skins. We seek deliciousness. We do everything by hand in small batches with lots of love and attention in order to fulfill our commitment to quality wine in the bottle. Time: Our Tasting Room is now open 11-5, 7 days.